Select Enrollments from the tabs bar. The course name or ID to search the current domain; to search all domains and/or browse through the courses you have access to, click the list (browse) icon at the far right of the User field (required). If you want to enroll the user in more than one course, click Add Another. A Start Date and an End Date for the enrollment (optional). 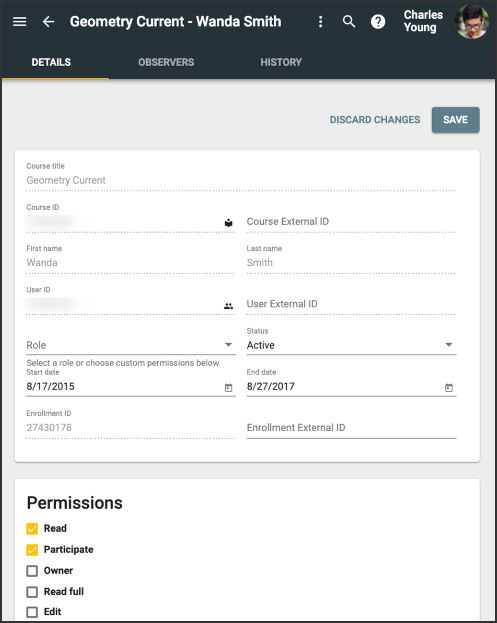 An External ID, which is any ID needed to align the enrollment with an external program or application (optional). Click Permission Details to see which permissions are granted by a selected role; if you want to create a custom role, check the boxes next to the permissions that you want included. Permissions granted here are applicable only for the specified course. You can also use this screen to manage and import enrollments. To edit or add observers to an enrollment, click the Enrollment ID. To see a course's enrollment details in the Course tool, click the Course ID. To delete an enrollment, check its box and click Delete; check multiple boxes to delete more than one at a time. To review and restore deleted enrollments, click Restore. To update multiple enrollments' Status (active/inactive), Role, Start Date, or End Date at once, check their boxes and click Bulk Update. These are permanent changes, so be careful. To import enrollments using a tab-delimited or comma-separated file, click Import and browse to the file on your computer. You can also import enrollments by clicking the ticket (enrollments) icon in the Domain tool's toolbar. Select the Enrollment ID for the desired course. Make the desired changes and Save. 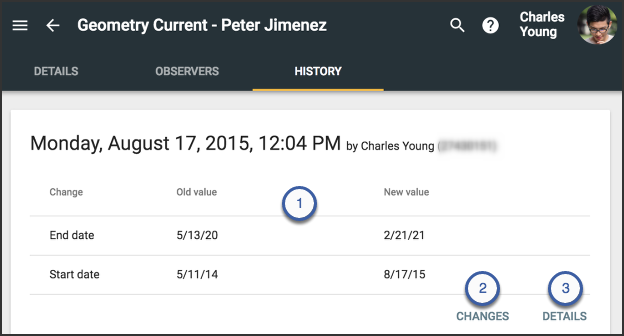 When an enrollment is selected, the History tab allow admins to review changes made to that enrollment. Click the View options (when available) to see the old and new values. Click Changes to see changed settings. Click Details to see current settings. Check the boxes for the enrollments you want to update and select Bulk update. 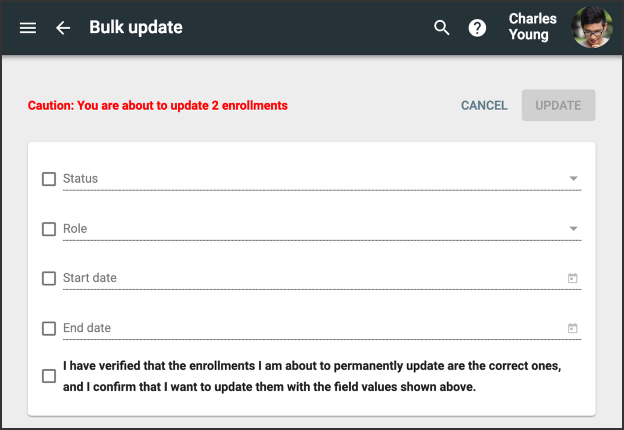 I have verified that the enrollments I am about to permanently update are the correct ones, and I confirm that I want to update them with the field values shown above. Once you have checked this box, click Update. Permissions granted here are applicable only for the specified course. Does deleting the teacher account have a negative impact on the course, even if the course has long been completed? If so, is it possible to use the UpdateEnrollments command in the API to "move" the enrollments from two of the teacher's accounts to the one we want to keep, and then delete the other two? I see that userid is a parameter for the command, but I can't tell if that would actually move the enrollment to a new user ID (and if so, would that cause any negative consequences). Deleting a teacher account does not have any negative impact upon inactive courses. In other words, no data is lost. 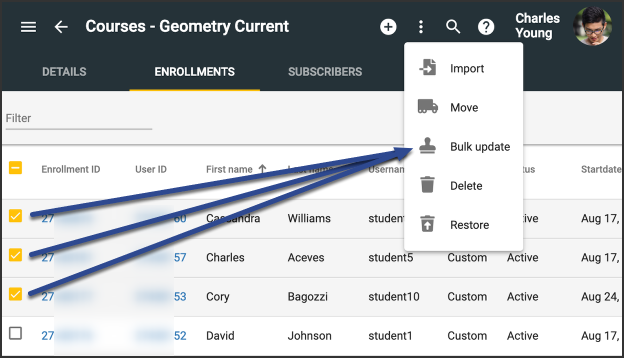 However, if the teacher has been deleted, then if the student looks at their grade history it will just show the user's ID that graded them, not the name of the user. But, you can use the UpdateEnrollments API to move enrollments between two different users. For example, update the enrollment and change the user ID. 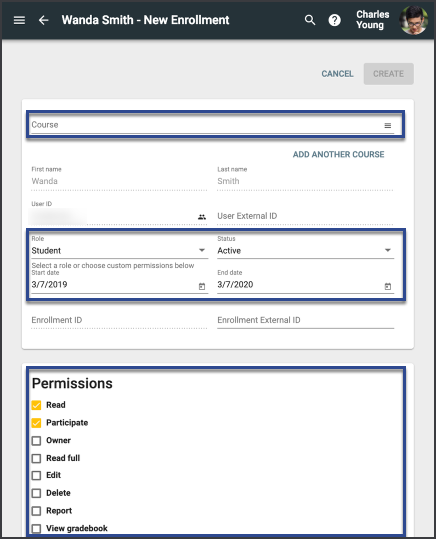 By changing the user ID from the old user account to the new teacher user account, it will be as nothing changed and the the single user account will have access to all of their previous enrollments.